If I knew what an osmosis test was I could be doing a lot more business as I get asked for it all the time. Dock talkers often use "pox", blisters" and "osmosis" as interchangeable terms however, there are different types, causes and degrees of blisters and using the word "osmosis" just confuses the issue and I usually find that people who throw these terms around don't really know much about the issue. I am often asked if I can perform an osmosis test to which my response is " What's an osmosis test ?". This response is met with a blank look as the people asking the question really don't know what they are asking. Many people also think that "osmosis" can be predicted by using a moisture meter unfortunately these meters do not measure moisture and the only way to determine actual moisture content is to cut out a chunk of your hull and send it to a lab. Also high moisture is not a predictor of blisters. Moisture may sit in a void for decades with no ill effects. This is one of the reasons I dislike the word "osmosis" as applied to boats, it has become a generic term to describe all types of blisters and moisture content in fiberglass hulls cored and uncored. What you are really encountering is simply water soaking into a porous material in addition to the moisture generated in the manufacturing of the resin. Polyester, epoxy and vinylester resins are not waterproof, they are hygroscopic ie. They can absorb and retain water ! (less so with epoxy and vinylester). I have heard many convoluted definitions of osmosis in attempts to justify the use of the word but what we really have is simply a process of absorption. Osmosis : The tendency of fluid substances, if separated by a porous membrane to filter through that membrane and become equally diffused. Strictly speaking for osmosis to occur you need fluid on both sides of a membrane. If you have this situation on a boat, you better start bailing. So lets forget about the semantics and get to the issue................ The root cause of blisters is moisture and there are many avenues of introducing moisture into the resin. To list a few ....... trapped moisture during moulding, under cured resin, over cured resin, aerated resin, incorrect timing of subsequent layers, absorbent fillers, voids, trapped moisture in core materials, stale catalyst, emulsion bound mat, dusty mould, hygroscopic dust, cold mould, inadequately mixed resin, uncontrolled temperature and humidity levels during moulding process, uncontrolled temperature and humidity of raw materials in shipping, orthopthalic (cheap) resins. OK .... enough ! If I really thought about it I am sure I could come up with more but let's just say this, it is an extremely complex issue and "osmosis" just does not cover it. If you insist on calling it osmosis then it follows that all fiberglass boats have it ! The cure? Sorry..... regardless of the chemical companies hype there is no gauranteed cure but most blistered boats will still outlast you. I have surveyed one local boat three times over the last 10 years and each time it was getting another $10k "epoxy bottom job". I refused to survey it a fourth time because a well respected shop was about to do it again using the same improper techniques as the previous three jobs done by others. Whoever buys this 42' motor yacht will be doing it again soon (if there is any laminate left).No voids = No blisters (maybe) : There are dozens of reasons for voids in a laminate (some chemical) and they can range from tiny champagne size bubbles to several square feet although most are less than 1/2" in diameter. The average laminate may be 8-15 layers of various types of glass fabric made up of millions of miles of microscopically thin glass strands wetted out with resin. It is unreasonable to assume that all voids will be filled whether the wet-out is accomplished by five guys with rollers or one of the admittedly better (but not perfect) vacuum bag processes. 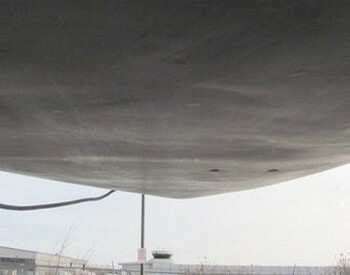 All fiberglass layups have voids, some more than others. The higher the void content, the bigger the voids and the more likely and earlier you will see blisters. Many reputable sources say Polyester resin is hygroscopic, that it can absorb water. Various sources state somewhere between 1 - 2%. 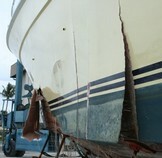 If this is true (I tend to think it is) a typical 30' , uncored sailboat hull can absorb about15 - 20lbs. of water or roughly 2% maximum weight of the resin. So theoretically 2% water content is saturation point of the material (voids excluded) and all polyester fiberglass boats left in water long enough will absorb water and may develop blisters. My moisture meter experience seems to bear this out when comparing new, never in water, unpainted hulls to older unpainted hulls. This is rarely a structural issue (at least in our lifetime) although it can drive the sailboat racers nuts ! If the hull is cored with balsa or the laminate is all or mostly chopped strand (read - very cheap boat) then you may have a more serious and expensive issue to deal with as the balsa rots when wet and in the case of chopped strand fiber, the millions of exposed fiber ends wick water like so many straws. The more common gelcoats are simply pigmented polyester resin of varying levels of quality and these pigments combined with the aeration caused by spraying the product into the mold can make it more permeable than the resin used in the laminate and therefore most blisters appear in the gelcoat. These blisters are usually small (1/8 - 1/4" dia.) and round in shape. While this does have an effect of the sale value of the vessel it is rarely a cause for concern. Vinylester gelcoats are becoming more common and are much more resistant to blistering. Under the gelcoat is usually a "skinout" mat of chopped strand glass fibers that does not contribute much to the strength of the hull but is used primarily to hide the basket weave pattern of the heavier woven fiber which (hopefully) makes up most of the laminate. When water passes through the gelcoat it may wick up the chopped strand fibers of the "skinout" mat. These blisters are usually small, elongated and again not a major concern except to the value of the boat as they can scare buyers. Water that has passed through the gelcoat and skinout mat into the structural laminate may combine with soluble elements that may occur in the voids. These elements could be uncatalysed resins, silane, glycol or salts (not the table variety) or any of the other chemical soup of ingredients that results from the resin curing (or uncured) process. When water combines with these molecules a new, usually larger molecule forms (hydrolysis), thus preventing escape of the fluid since the molecule is now bigger than the microscopic hole it came in through. Hydrolysis : A chemical process by which the oxygen or hydrogen in water combines with an element or some element of a compound to produce a new compound. As these newer, larger molecules multiply deep in the laminate they can get big enough to start to pushing apart the various layers of the laminate as the resin dissolves. This can be a an issue requiring repair, it is however relatively rare. Put on a pair of safety goggles and puncture a few blisters. If they are dry or release a clear fluid, you likely do not have the serious type of blister. If an acidic vinegar like fluid appears this could be the more serious "Hydrolysis" type blister. Be careful as some of these blisters contain fluids under tremendous pressure. If the blister is very large and cannot be punctured with an ice-pick, it is likely very deep in the laminate, in this case drilling a hole for closer inspection may be warranted. 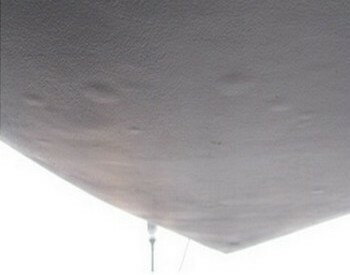 The more dry a boat is the better chance you have of getting a barrier coat to stick. 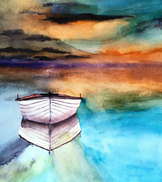 Unfortunately once a boat has been in the water for a few years the water is deep in the skin at a molecular level and it is difficult to get out. Small blisters in the gelcoat may be repaired by sanding, drying and applying an epoxy or vinylester bottom coat. This may help the resale value of your boat. Blisters in the skinout mat can be repaired by the same method but with much more aggressive sanding and perhaps some patching. The larger hydrolysis blisters require complete removal of the gelcoat and probably the skinout mat and perhaps a layer of the laminate perhaps in local areas or over the entire hull in which case new cloth may be needed in rare extreme cases. The hull must then be dried to the point where the epoxy or vinylester bottom coat will adhere and washed frequently with fresh water during the drying process to wash off as much of the hydrolytic fluid as possible. This fluid and water may weep from the hull for weeks, months or even years so washing is crucial to providing a clean surface to ensure the adhesion of the new barrier coating. This can be a bit of a gamble. 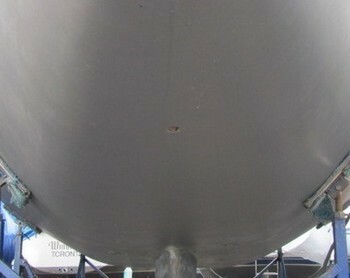 Many bottom coats fail because the hull was not dried or washed properly. I have seen boats put under heat lamps for six months before bottom coating and new blisters appeared within a few years. The moisture is so deep in the laminate at a molecular level that it is not easily evacuated. A relatively new system ( Hotvac) of applying heat under vacuum makes sense to me but I have not seen it applied. Although blisters will have a negative effect of the the resale value I have only ever seen two cases where I thought they posed a structural threat to the hull and both of those were balsa cored. Give this careful consideration before plunking down $5,000.00 - $10,000.00 - $20,000.00 or more for a bottom job and always ask for a written guarantee (unlikely). 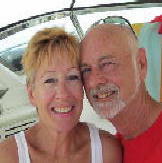 Consult an Accredited Marine Surveyor® before spending you're hard earned money.